Well, this was my first attempt at actually cooking rice porridge. I soaked the rice overnight, and cooked it in lots of milk, a little sugar and salt, and a little butter. I can't give you measurements, nor can I tell you it was highly successful, so I'll have to try again. It tasted good, but I should have added more milk. Try it in your crockpot . . . butter the pot, use ~240g rice to about a litre of milk and then cook on low for 4-5hrs. A split vanilla pod is always good too. Great suggestion, I really do want to try it in the crock pot. Although I need to find a way to make it overnight.. ideally. I'll make a lovely rice porridge this way: put a cup of porridge rice (I usually rinse it once) and a cup of cold water into a saucepan, bring to boil and simmer for a few minutes. Then I add a litre of whole milk and a pinch of salt and then simmer gently for about 30-40 minutes. I don't like adding sugar at this stage, as I usually serve it with loads of jam - or then just a little butter. Works very well for risalamande etc as well..
Well, your rice porridge *looks* absolutely delicious and you've inspired me to get out of my rut and go to the store to buy some rice to make this for myself. 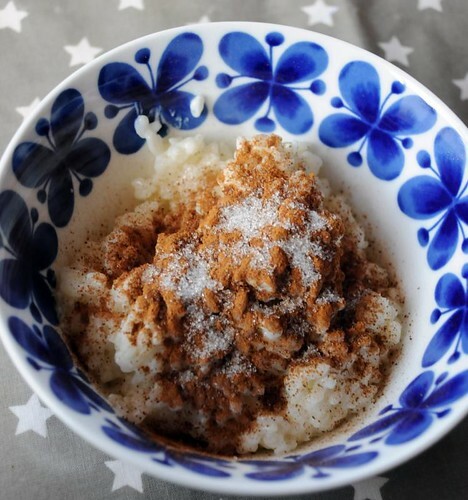 It's a lovely picture of the porridge--thanks for sharing! p.s.-- Sorry I disappeared for a bit. The move from the states to Germany has been quite time consuming!